I think I found Caligari Records as well as Heavydeath as the same time. It was a wonderful afternoon / early morning. 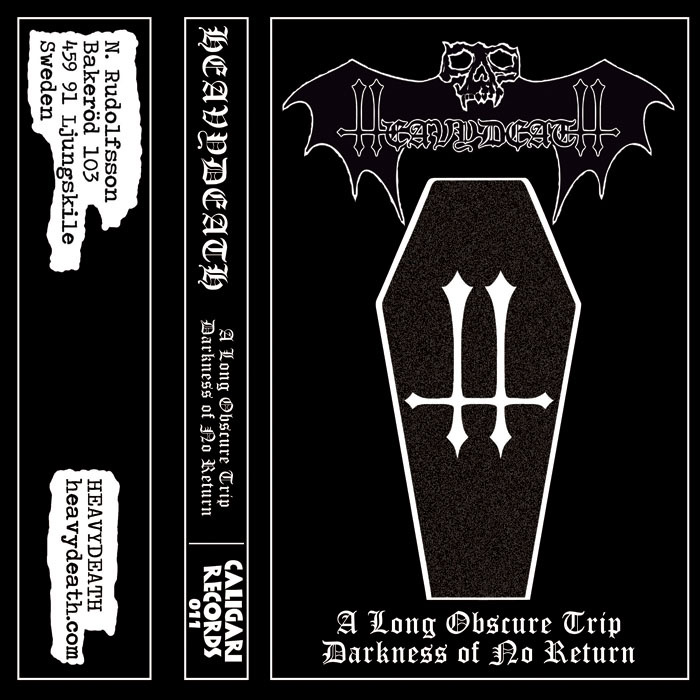 Caligari Records is a spectacular label / distributor which specializes in lesser known cassettes of a particularly rotting variety. 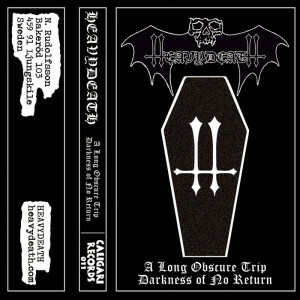 Heavydeath is a band made up of members of Runemagick and Necrocurse who specialize in a particularly rotting variety of death/doom. Though death/doom isn’t entirely novel, Heavydeath’s approach to the style is not only refreshing but it is a cause for feverish excitement as their 2014 trilogy of demos far surpasses most releases this year. What separates Heavydeath from other death / doom is their embrace of the traditional style of doom. This doom comes with guitar wails, and a slightly optimistic swagger. Additionally, the vocals from Nicklas Rudolfsson are positioned in such a way to reflect the snarl of old school death metal. Much like Demo I, the subsequent releases from Heavydeath are almost seamless tracks which hover around the 20 to 30 minute mark. This means all three could consistute one damn fine full length release. As a cohesive piece, Demo I and Demo III are the most interesting with the second being the most buried in heavy death/doom. Demo I pique interest with Demo II flinging the listeners to the far reaches of blackness. The opening warped riffs of Demo III, however, welcomes the listener back from the journey with stoner banners and a tone of maniacal celebration. Rarley has death/doom been this interesting and exhilarating to experience. Heavydeath simulates a flume ride which descends into something that is darker and thicker than water. Heavydeath have created something special which maybe familiar to fans of Runemagick. For those not, then Heavydeath walks the listener hand and hand through a land of traditional darkness. The band’s attitude makes up its largest selling point as there is no point in these three demos where the listener feels hopeless and suffocated. Heavydeath empowers its listener to become masters over their blighted realm. By the opening warped riffs of Demo III, every listener will become a Baron with an esate of decay and ruin. Heavydeath is a festering noble class and these releases have the potential to create empires of rot.